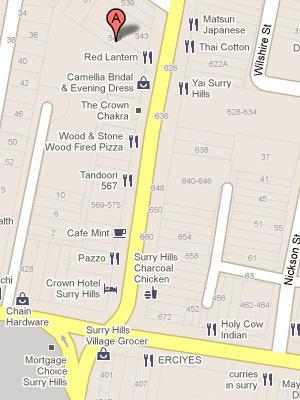 And now folks, we once again time travel back to Sydney to the hip and cool suburb of Surry Hills. Where do you think I’ll be bringing you? Why, to Red Lantern of course! Anyone that has heard of Red Lantern immediately associates it with the famous celebrity chef Luke Nguyen. However not many know that this is actually a sibling operated restaurant. 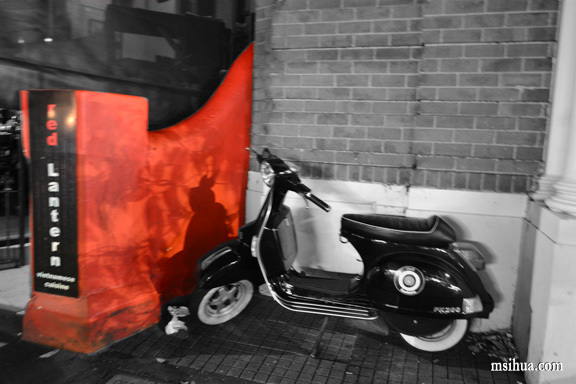 The creative brainchild of Pauline Nguyen (Luke’s sister), Luke and Mark Jensen (Luke’s brother-in-law), the Red Lantern in this exciting suburb has garnered a strong following of admirers, especially those who tune into SBS on a weekly basis to catch Luke and his adventures in Vietnam. So when we were up in Sydney this Easter holidays, I insisted that we had to try it out. 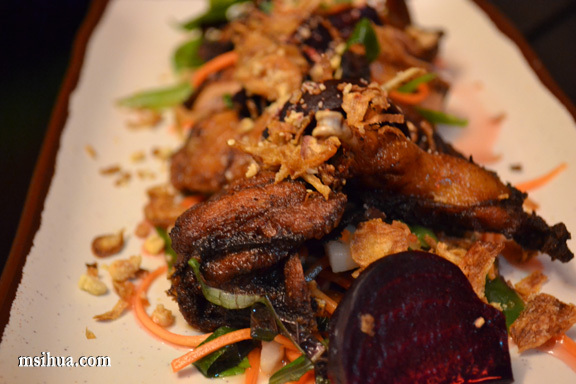 I love Vietnamese food and being South-East Asian, I feel that I am able to give an honest review of a restaurant deigning to serve authentic Vietnamese cuisine. That’s not to say, that others from different backgrounds are not able to give honest reviews, but these are flavours that I have grown up, known, love and hold very dear to my heart. It’s similar to saying, I can’t give a full honest review on a strict French restaurant, as I feel that I don’t know enough or have experienced enough French food in France to be able to pass that judgement. All I can say is if it appealed to me, and if it was good. So on we trekked to Surry Hills and showed up on time. We had to wait a little bit whilst they cleared the table. I managed to spy during this time, on what other dishes the patrons of Red Lantern were enjoying. We were presented with 3 menus. 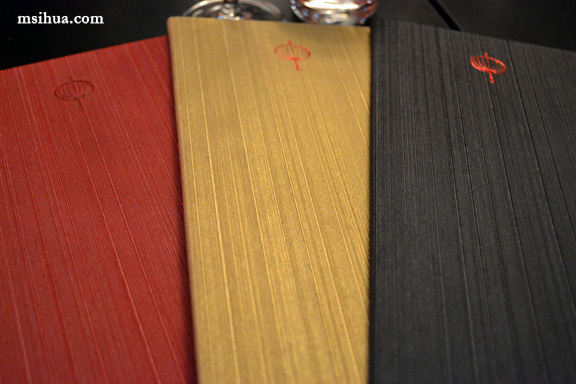 I absolutely loved the simplicity of the menu covers. One for drinks, one for ala carte and one for the banquet menu. After looking through the banquet style menu, we decided to forego it and go with an ala carte banquet of our own! We had initially thought to go with the banquet menu, but once we had a glance at the ala carte menu, we knew we wanted to try other dishes not offered in the former. We decided to start with a simple light and authentic Goi Cuon – Soft rice paper rolled with prawns, pork, vermicelli, perilla leaves and garlic chives; served with dipping sauce ($16.50). The rice paper was so thin and delicate, I swear if I were to wrap it myself, it’d tear all over! I really like rice paper rolls and this is one of the nicest and freshest rice paper rolls that I’ve eaten to date. The key to this dish? 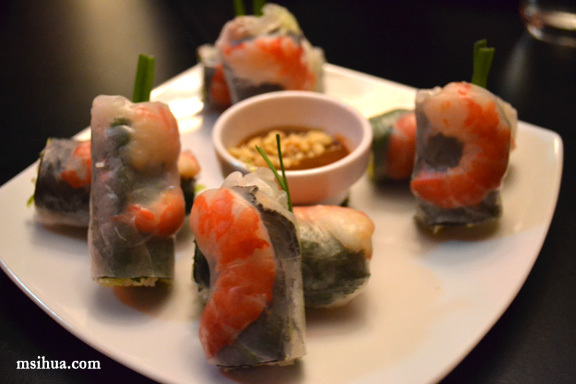 The thin rice paper used and fresh prawns. For our second entree, we ordered Chao Tom – Tiger prawns paste wrapped around sugar cane, served with vermicelli, perilla and mint; comes with dipping sauce ($24.00). This was easily the winning dish of the night. I regret that we didn’t order two serves of this! Texturally, this little dish was an amazing eruption of flavours. First you have the soft and juicy tiger prawn paste, then you have the soft and delicate vermicelli. To top it all off, the light crunch of the sugar cane when you hit the middle, bliss! To be adventurous, for the mains, we ordered Chim Cut – Five spiced quail with a salad of roasted beetroot, green beans, perilla and mint ($26.00). This reminded me of crispy chicken wings served in the back alleys of Kuala Lumpur (that’s the only comparison I can draw on, having never been to Vietnam), but I could definitely imagine myself squatting in the back alleys of Ho Chi Minh and munching on this little crispy beauties. Plus it had beetroot (not very South East Asian) but I like beetroot! We also had to have Suon Nuong – Char grilled Berkshire Pork cutlets marinated in honey, lemongrass and shallot oil ($32.00), which went really well with rice. 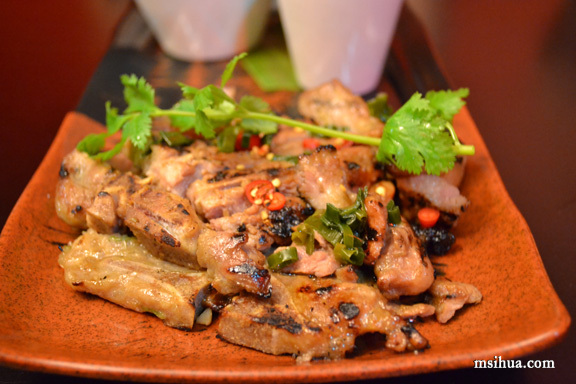 I love lemongrass pork of any variety! 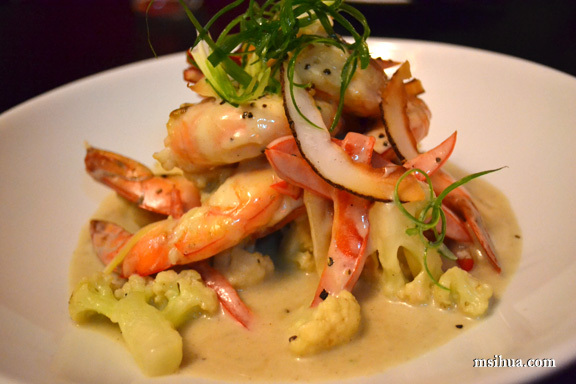 For the last main, we ordered a Tom Xao Voi Bong Cai – Saute of Spencer Gulf prawns, cauliflower and red peppers finished in coconut milk ($38.00). The coconut milk was fresh and hence it really accentuated the flavours of this dish. Loved the creamy taste and delicious sweet prawns in this. 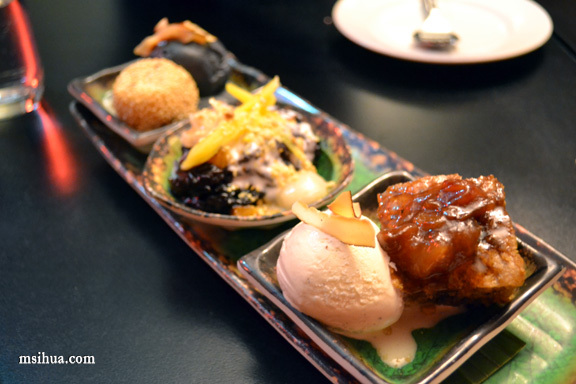 We definitely could not pass up on the Chuoi Chien – Organic banana fritters crumbed in coconut rice, palm sugar caramel and tapioca sauce, served with vanilla ice cream ($15.00). 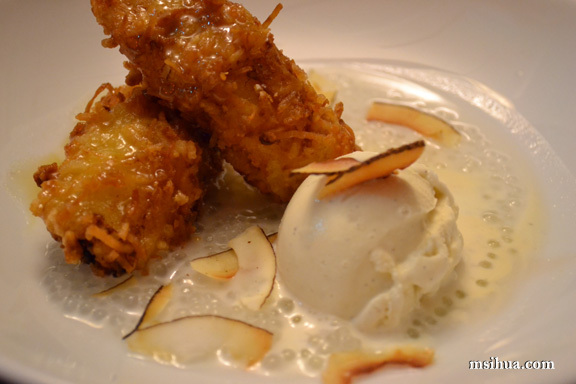 Fried banana in batter? Yes, please. And thank goodness we did, as it was the winning dessert for us that night! Crunchy on the outside, soft on the inside. Yum! However, being greedy little pigges (I speak for myself, but can assure you that the other three had the same thoughts running in their heads), we couldn’t just say goodnight via two lonely banana fritters. We had to have more! And so we did. Now I’m not a big fan of Asian desserts (I know, I blame this on being dropped onto the ground whilst still a baby –> BIG SIS I’m looking at you!). And the only element I really liked on the dessert platter was the Che Mit. Love glutinous black rice! 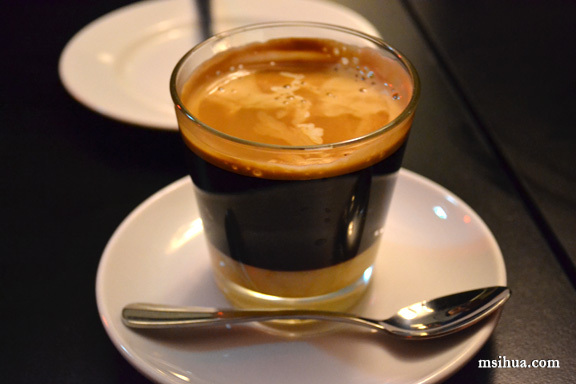 To finish up, Big Sis and I ordered a glass of Vietnamese Liqueur Coffee – single origin coffee with brandy and sweetened condensed milk ($12.00) to share. A note of warning to those wanting to try this drink, it is very very strong. The condensed milk in this drink does nothing to lower the sharp hit of liqueur so don’t be fooled. Did I like the drink? I did actually, I like my drinks strong and heady! Hee hee. Verdict: I absolutely loved this restaurant. I know the prices are a bit extravagant for local Vietnamese food. 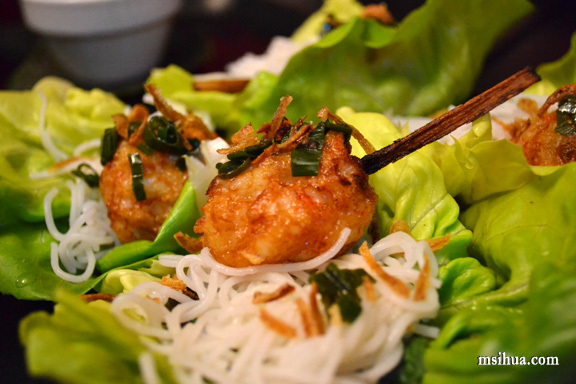 But I will definitely return for a taste of authentic Vietnamese food cooked with fresh Australian produce! Yum! Hello fried bananas! I have to order it whenever I see them on the menu. Hahahaha… loved the fried banana.. and it’s really good..
Hey guess what I totally knew Red Lantern iss also owned by Mark Jensen. That’s what a student lifestyle of watching Ready Steady Cook instead of writing essays will do for a girl! Random food trivia knowledge! Wheeee! I ALSO love (I’ll shut up eventually) Vietnamese food, so almost everything here looks divine to me. I wish I could’ve had your share of the black sesame ice cream! Wah you really can drink ah! Hahaha… it was only one drink!! The Chao Tom sounds great! 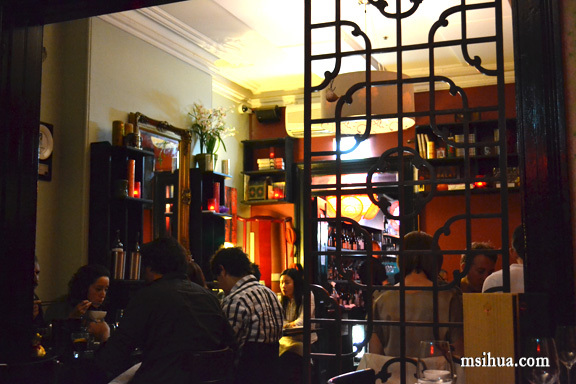 It’s ideal to go with a group to places like this so you can have and share lots of dishes! Might have to check out the Red Lantern next time we visit. Love his book! Great review! 🙂 Every time we try to go there it’s always booked although a friend of mine recommend going there for lunch. And hehe I always try and see what everyone else is ordering too! I’m short sighted though so it proves a challenge!